According to @rachbarhart via her Twitter account, 31 people were arrested in Rochester’s Manhattan Square Park for being there after 11pm. The City code states that being in the park after 11 is a violation for which you can be arrested, as any skater kid in town knows well. Lets applaud both the cops and the protesters for handling the situation with dignity and what appears to be a bit of respect. Compared to the ugliness in other cities, we certainly have a lot to be thankful for in Rochester. Nevertheless, that the code even needed to be enforced is silly. To state the obvious, in a democracy we are all responsible for the rules by which we live. We vote for leaders and take responsibility for abiding by the rules – laws or ordinances – that those leaders put in place. Thats why if I decided to ignore the city ordinance against being in the park past 11, I would expect to be asked to leave by police, possibly even arrested. But if we’re all responsible for the laws that govern us, then surely in cases of peaceful protests – especially ones that are in conjunction with an entire national movement – we can as surely let those rules slide a bit. Not nullify laws or strike down ordinances permanently, not advocate chaos and anarchy, just let things be in this one case. That is especially true in the case of a city ordinance, which after all, is not even a law. Rochester is certainly a small-c conservative town. We like our rules and we like our orderly existence, so maybe its not so strange that what happened last night happened. Hell, we can’t even get food trucks downtown. But I think also some blame can probably be assigned to the general inertia of our sad City government these days, as this does strike the same leaden, tone-deaf chord as City reactions to Kodak and PAETEC. Occupy Rochester Protestors Arrested – Rochester, News, Weather, Sports, and Events – 13WHAM.com. Don’t forget people, the rally to voice our opposition to bandwidth use charges like Time Warner’s Internet Cap gets started in less than an hour from now at Highland Park! Long time readers and good friends of this website JF and MC have been keeping me up to date with all the latest discussions and information regarding the Time Warner Capped Internet proposal and its resistance. I’ve not been able to keep up with all this too carefully, but today I’d like to bring the site up to speed the best I can. 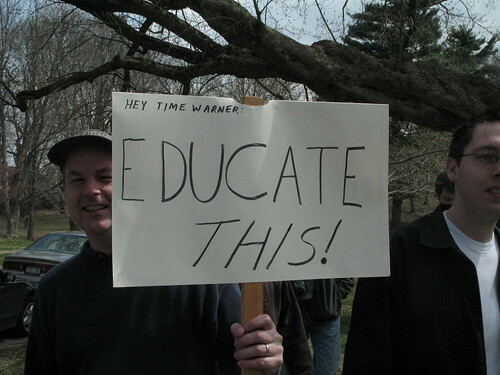 There is a protest scheduled to march from Highland Park to the Time Warner headquarters on Mt. Hope Ave by South Ave. Here is the FaceBook event and here is an Upcoming.Yahoo.com event I created for those who don’t use FB. The event details are also posted in the right hand navigation of this website. The place to keep an eye on the protest is StopTheCap.com. Keep an eye on Fighting29th.com for good discussions of the Time Warner cap. He’s been doing yeoman’s work on this issue over the last few weeks. Chuck Schumer will be attending the protest on Saturday. I’ve put in contacts with a bunch of other local politicos to see who is aware of it and who is attending. I’ll report back as I hear from them. One politico it is safe to assume will not be attending is Chris Lee of the 26th. Rochester Turning has the scoop on his position, which is the typically Laissez Faire attitude that’s done us such wonders for the last eight years. I love you, man. That’s all I have of substance for right now. Keep an eye out here for new updates. Please contact me if you have any information! In particular, if you are a Time Warner employee, I’d love to hear what you’re hearing from the inside. Know that your information is always confidential on this website, unless you wish it otherwise. On my lunch break, I passed by the public safety building where at least three dozen people are currently protesting. I have no idea what they’re protesting, because I couldn’t stop, but the signs look like a wage fight. I haven’t seen anything on the news, but the 13WHAM truck was definitely there, so I’m looking at them for an update. . .
It’s gone viral. An email sent out by one passionately enraged man has spread all over the Internet and there appears to be a gigantic protest scheduled, dumping garbage in the middle of Wall Street. The article doesn’t say when, though. . .